If you're going to lead, it’s inevitable that you’ll face a crisis at some point in your career. And it’s in moments of crisis that you’ll show what you’re made of—can you rise to the challenge, think critically, and lead through ambiguity to a successful outcome? Or will you falter? 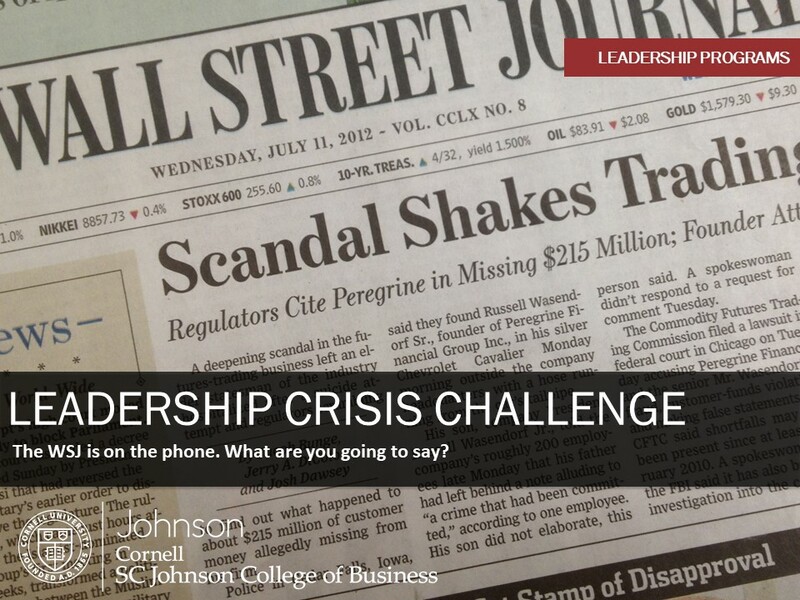 Find out at the Leadership Crisis Challenge. You need to be able to step up and lead during times of crisis, change, and uncertainty. That’s why we’re inviting you to participate in our sixth annual Leadership Crisis Challenge. This intensive case competition/simulation exercise will throw you headfirst into a crisis situation so you can both test and further develop skills that can’t possibly be captured in a classroom. Plus, the winning team will take home $2,000! Each team must have three or four members.Teams can be made up of any combination of two-year, one-year, Tech, or exchange students. Once you have your team, you'll need to choose a team name. Then, each member of the team should register here on CampusGroups. You will not have a slot until everyone from your team signs up. Need Help Finding Teammates? Use this link here. 7:10PM - 11:45PM: Teams work on the case.